This week, Citi Taste of Tennis Miami returns to the SLS Brickell, Edge Steak & Bar’s executive chef Aaron Brooks hosts a cooking class and happy hour with Australian lamb, and Three launches Burger at the Bar with Adrianne Calvo. Citi Taste of Tennis Miami at the SLS Brickell’s Altitude Pool Deck. Returning Monday, the annual event will bring together tennis fans and star athletes for an evening of food and drink cooked up by local chefs. Event headliners include legends Venus Williams and John Isner alongside chef Adrianne Calvo, who will lead a cooking demonstration with players Sascha and Mischa Zverev. Keep an eye out for bites by Brad Kilgore, Makoto Okuwa, Karina Rivera of the newly opened Bachour Coral Gables, and more than a dozen other chefs. A portion of proceeds raised will benefit Ocean Conservatory. 7 to 10 p.m. Monday, March 18, at the SLS Brickell’s Altitude Pool Deck, 1300 S. Miami Ave., Miami; tasteoftennis.com. Mojo and Mojitos at Havana 1957. 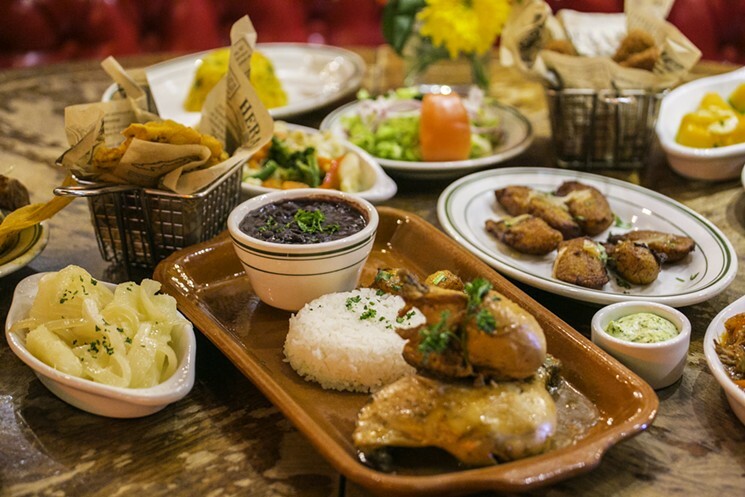 This week, Havana 1957 celebrates its sixth anniversary with specials through the weekend. Highlights include a mojo and mojito pairing, in which customers receive a free mojito with an order of any dish that includes mojo; and a discounted version of Havana 1957’s signature dish, “La Especialidad de la Casa,” which will be priced at $19.57 and includes roast chicken, Cuban gravy, black beans, white rice, and sweet plantains. Monday, March 18, through Sunday, March 24, at Havana 1957, 819 Lincoln Rd., Miami Beach; 305-397-8683; havana1957.com. Burger at the Bar at Three. Wednesday, March 20, Three launches a monthly burger promotion that will host a different Miami chef or personality to create a unique burger and alcohol-infused milkshake pairing. Served exclusively at the restaurant’s bar on Wednesday nights, the promotion this month will include a burger designed by chef Adrianne Calvo. Priced at $25, the burger features two grass-fed, hormone-free beef patties topped with red onions, sliced pickles, and a homemade dijonnaisesauce, served on a toasted Zak the Baker brioche bun. It’s accompanied by thin fries and Calvo’s spiked double vanilla malt milkshake. Beginning at 5:30 p.m. Wednesday, March 20, at Three, 50 NW 24th St., Miami; 305-748-4540; threewynwood.com. Parcela Opens Inside Life House Little Havana Hotel. Located on the first floor of Life House, Parcela opened this past weekend, specializing in local-minded dishes inspired by the urban agriculture movement of Havana, Cuba. The restaurant serves daily breakfast, with a menu including a Puerto Rican-style sweet bread made by True Loaf Bakery; Florida aguacate, a take on avocado toast prepared with True Loaf’s multigrain toast and Florida avocado; and an assortment of Cuban-style pastelitos, one of which is vegan. For lunch and dinner, guests can choose from a selection of salads, sandwiches, and bowls available on the café’s all-day menu. Latin-inspired dishes include a pan con bistec that can be made with churrasco or adashah — a vegan alternative made in Miami — for a classic Cuban sandwich. 528 SW Ninth Ave., Miami; lifehousehotels.com.